During World War I, gruff Germany finds Italy hiding in a wooden box of tomatoes. Germany takes Italy as prisoner, but instead of war-like interrogation, Italy becomes more of the nuisance and unwanted guest. World War I quickly comes to an end, but World War II is right on its heels! This time, Italy tries his best to become friends with Germany. They soon befriend Japan, and the three of them form the Axis Powers. Meanwhile, America, who loves heroism and hamburgers, tries to form a treaty, as Great Britain reminisces about when America was his loving child. I liked the animation more. The art keeps getting better and better. Still funny as hell. Can't wait for Volume 3! It was great. What else can I say? 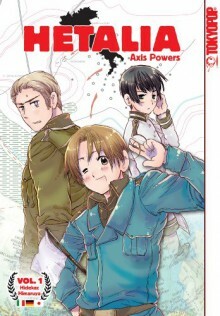 I've been in love with Hetalia for almost half a year and I'm happy that I have the English version of the manga with me now. It was lots of fun re-reading it and the art is a pleasure to look at.